NARI Certifications were developed to recognize highly experienced remodeling professionals, capable of planning and managing complex remodeling projects to client satisfaction. Certified professionals represent an elite group of industry experts who possess an extensive technical and management skill set that sets them apart as capable remodeling professionals. NARI Certification Standards and exam questions were developed by leading remodeling experts, well versed in technical and management best practices for the remodeling industry. NARI Certification is governed by the NARI Certification Board. NARI Certification is a worthy investment in your career. Aren’t you worth it? Increase your visibility in a crowded marketplace. The highest level of certification NARI offers. Designed for professionals who have held the CR designation for a minimum of 10 years, hold another NARI certification and have demonstrated leadership within NARI or within local community. Designed for highly experienced industry professionals who provide a full range of remodeling services. Often pursued by owners or upper management of a remodeling organization. Designed for highly experienced industry professionals who provide remodeling services specific to kitchens and bathrooms. Often pursued by owners or upper management of a remodeling organization. Designed for experienced field professionals who oversee the technical aspects of the project, including personnel management and material flow. Designed for professionals overseeing the administrative aspects of a project: customer satisfaction, scheduling subcontractors, record-keeping, risk management, financial controls, etc. 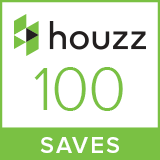 Designed for professionals who handle renovations for improved accessibility and ease of use. NARI Certification is a robust and challenging process, reserved only for those remodeling professionals who demonstrate extensive expertise in their field and pass the rigorous screening and testing process. Candidates must demonstrate technical skill, business and project management expertise, and tenure in the industry based on their selected certification’s specific and detailed requirements. All candidate applications are subjected to comprehensive review by the NARI Certification Board to assure all program pre-requisites are met and the candidate is eligible for certification. Eligible candidates could chose to attend certification study groups hosted by their local chapter, attend the rigorous, multi-week preparatory courses provided by NARI, or self-study. All eligible certification candidates must undergo and pass a rigorous examination, overseen by an examination proctor adhering to strict integrity criteria. 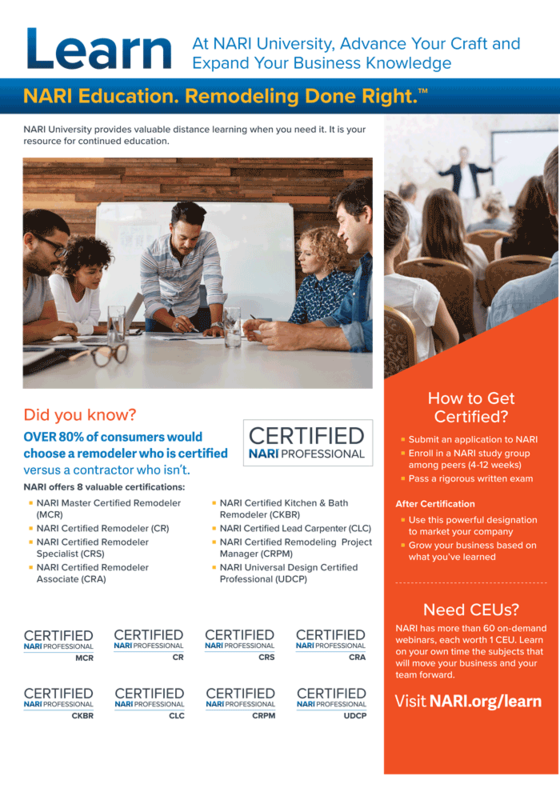 NARI certified remodeling professionals must meet annual recertification requirements involving continuing education and participation in industry programs. Email us if you have any questions, or give us a call at (703) 400-1858.